If you don’t like Godhumai Adai, think again???? I had this recipe in my collection of recipes. I am not a big fan of wheat. If I make anything using wheat flour like godhumai dosa, godhumai adai etc. the side dish has to be really tasty. If not, it would be a big NO NO from me. Though I don’t like wheat dosa, I make it a point to make at least once in two weeks for my hubby. My hubby loves healthy food. I was very hesitant to try out this adai but then made up my mind and made it two days back. I should say I just loved it. Though it is quite heavy because of the veggies, I like it very much. I usually have it with Coconut chutney,Thogayal, Sambar, Tomato Mint Chutney and Til chutney. 1. In a large mixing bowl, add wheat flour, rice flour, turmeric powder, garam masala, grated carrot, chopped onion, chopped cabbage, coriander leaves, curry leaves, salt, and water. Mix well to form a thick adai batter consistency. Note. The batter consistency should neither be too thick nor too thin. The consistency should be in between. If the batter consistency is too thick, add little water. If the batter consistency is too thin, add 1/2 cup of wheat flour and 1/4 cup of rice flour and bring it to thick consistency. 2. 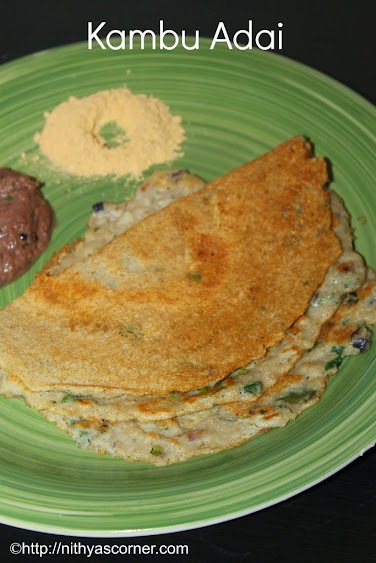 Take a scoop of vegetable adai batter in a ladle and spread the batter in a heated dosa pan. Apply 1-2 drops of oil on the corners of the adai. When it turns golden brown, flip it over. Then, cook for a minute or so. 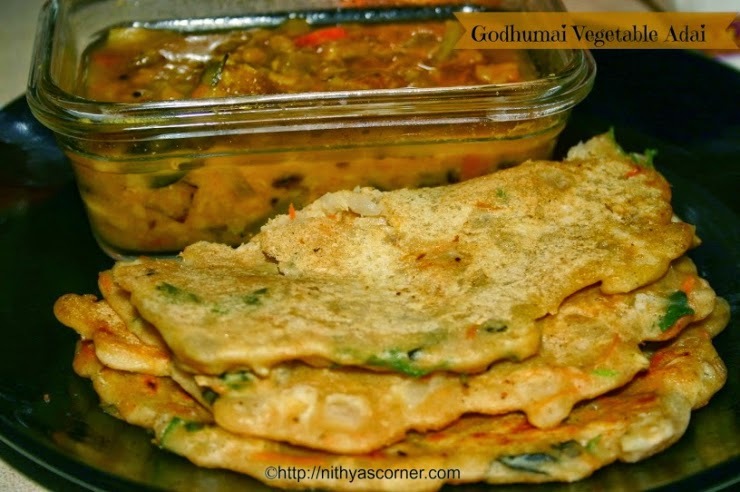 Now, Godhumai Vegetable Adai is ready! This entry was posted in Adai and tagged Godhumai Adai, Mint Chutney, Rice flour, Wheat Flour on November 22, 2014 by vikashbhardwaz. 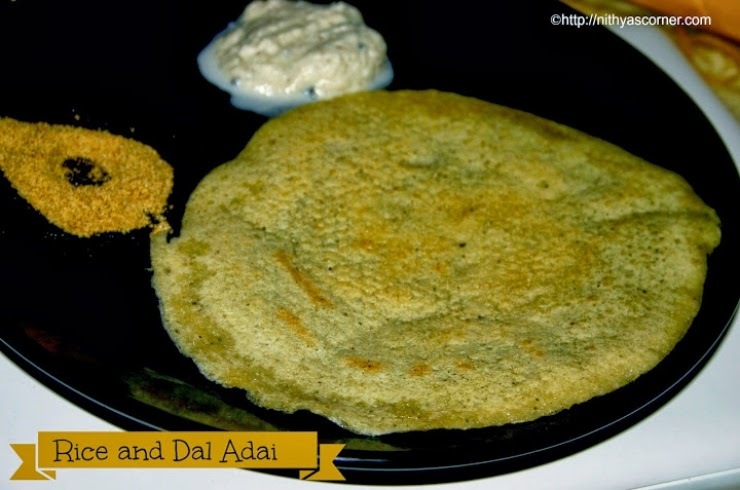 A very healthy and tasty adai! I make Kambu adai very often at home as it is very good for health. I wanted to take pictures all the time when I make it, but somehow I miss it every time. This time I made sure to take pictures as much as I could and here I am with the tasty Kambu Adai recipe. Try it out and you will like it. It is not difficult at all. Beginners, you may refer “How to buy and store toor dal?” as a quick reference. Small Onions (finely chopped) – 7 nos. 1. Soak pearl millet (kambu), Channa dal(Kadalai paruppu), Toor dal(Thuvaram paruppu), and Urad dal(Ulutham paruppu) in water for about 2 hours. 2. Drain the water and add a pinch of asafoetida and red chillies and grind it coarsely. Add little water if necessary. 3. Finely chop the onions, curry leaves and coriander leaves. 4. Add saunf powder (sombu thool), chopped onion, curry leaves, coriander leaves, and salt to the batter and stir well. 5. Heat a dosa pan. Take a ladle full of batter and spread it in a round shape. Apply oil on the sides of the adai. When adai is cooked on one side, flip it over and then cook on the other side too. Now, Kambu Adai is ready! Do not grind the batter finely. Once you spread the batter into round shape, you can add chopped onions on top of it and then carefully flip it over when one side of the adai is cooked. You can also fry the onions separately and add it to the adai when one of its side is getting cooked. Fried onions gives a good flavor compared to the raw onions. 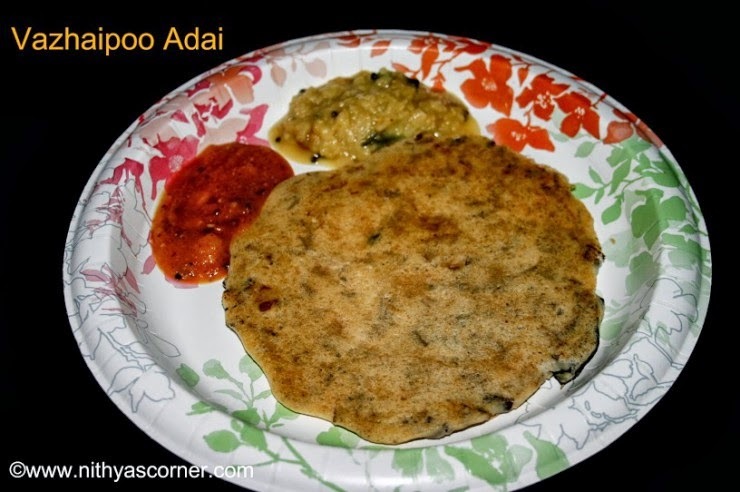 What is the difference between Kambu Adai and Kambu Dosa? 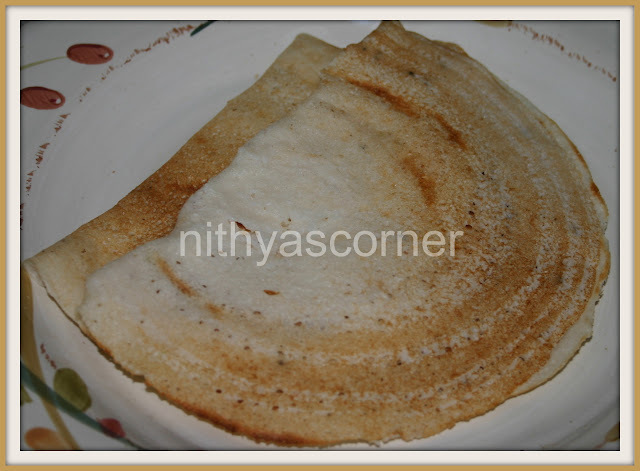 Kambu Dosa – Have to ferment the batter overnight. 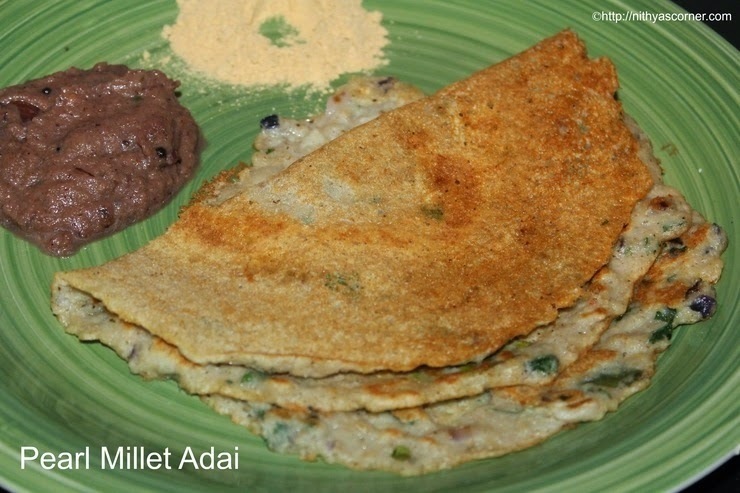 Kambu Adai – Batter can be used instantly to make adai. No fermentation is needed. This entry was posted in Adai and tagged coriander leaves, Curry Leaves, Kambu, Kambu Adai, Pearl Millet on November 22, 2014 by vikashbhardwaz. 1. Soak the raw rice and Toor Dal in water for 2 hours. 2. Grind the raw rice and Toor Dal along with the rest of the ingredients. 3. Heat the dosa pan. 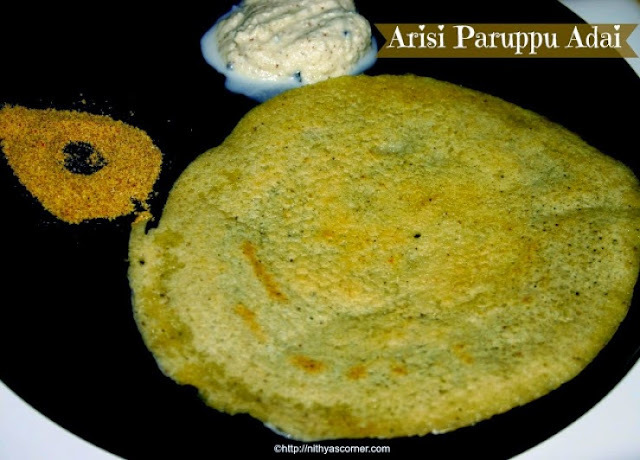 Spread the adai batter on pan in a circular motion to make a medium sized round adai. 4. Cook on both the sides. Now, the Malayala Adai is ready! This entry was posted in Adai and tagged Malayala Adai, Raw Rice, Toor Dal on November 22, 2014 by vikashbhardwaz. 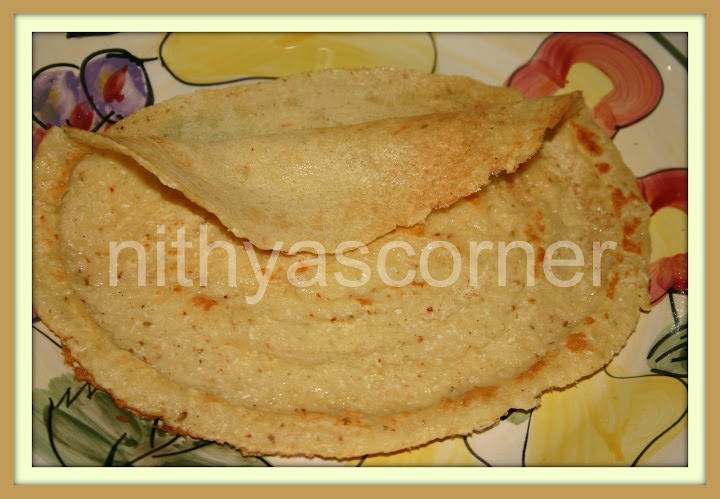 When I do not find time to make dosa and Idly batter, I make this adai and have it along with sambar and chutney. I will have two adai, and my stomach becomes full. Usually, people say do not eat adai for dinner as it takes time to digest. Then, why not have it in the morning? Have two to three adai and you are all set for next 3-4 hours. Beginners, You can refer How to Cook Lentils?/All About Lentils to know how to buy lentils. Red chillies – 5 To 6 nos. 1. Wash and soak the rice in water for 1 and 1/2 hours. Wash and soak the dals for 1/2 hour just before you are going to grind. 2. Drain the water from the soaked rice. Grind the soaked rice into to a coarse batter and pour it into a large mixing bowl. Consistency of the rice batter should neither be loose or thick. 3. Likewise, grind the soaked dals using very little water into a coarse batter along with the rest of the ingredients. Pour it into the same mixing bowl. Consistency of the dal batter should neither be loose or thick. 4. Now, using a ladle mix both the rice and dal batter well. 5. Heat a dosa pan. Using a ladle, take the batter and spread it on the dosa pan. Apply oil on the corners of the dosa. When one side of the adai is cooked, flip it over to cook the other side. The cooked adai will be like a Paper Roast Dosa – very crispy. Now, Rice And Dal Adai is ready!!! 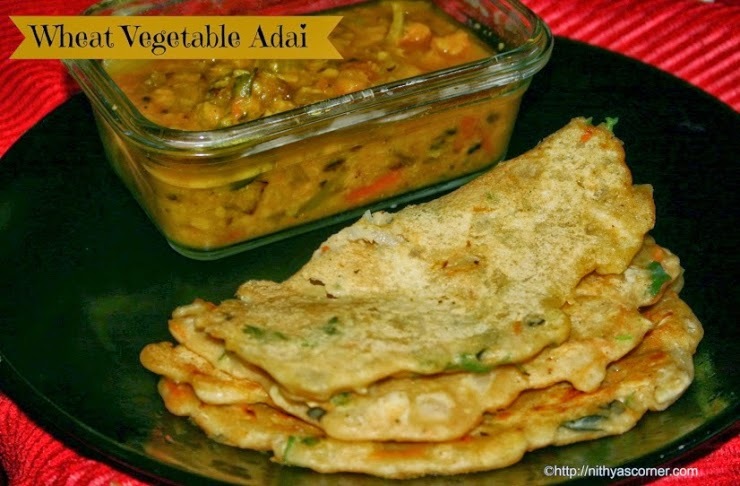 This entry was posted in Adai and tagged Breakfast Recipe on November 22, 2014 by vikashbhardwaz. I do not get Banana Blossom (Vazhaipoo) often in my place. We would have to travel 2 hours to get a good vazhaipoo so whenever I get a chance, I would buy 2 or 3 and make lot of dishes using vazhaipoo. My mom-in-law makes vazhaipoo vadai often and my mom makes vazhaipoo kootuoften. You know what I make often? I make this Vazhaipoo Adai often. Will post Vazhaipoo Vadai recipe soon. It also tastes very yummy just like this tasty Adai. First time when I heard about Vazhaipoo Adai, I wanted to try it out right away. Since then I started liking it so much but removing and cutting vazhaipoo only is a cumbersome process. I usually do it during Friday night while watching movies with friends. Then I put it in buttermilk and cook on the next day. I like doing the cleaning part but need to allocate some time to do it slowly at my own pace. So how many of you have tried Vazhaipoo Adai so far? Red chillies (Kanja molaga) – 4 to 6 nos. Finely chopped banana blossom florets (Vazhaipoo) – 2.5 cups (If you are going to use the vazhaipoo later, soak the florets in buttermilk or else the florets will become dark). Curry leaves (Karuvepillai) – 10 nos. Chopped onion – 3 to 4 nos. Chopped green chillies (Pacha molaga) – 4 nos. 1. Soak all the dals and rice together for 2 to 3 hours. If you want, you can soak and grind each of them separately and then add everything together. To the soaked dal and rice, add red chillies, asafetida, ginger, and salt. Add very little water and grind well to a thick batter (little thicker than the idly batter consistency). 2. In a pan, heat 2 teaspoons of oil. Add mustard seeds and let it splutter. Then add curry leaves. 3. Add chopped onion, green chillies, and coriander leaves. Fry till onions become light brown. 4. Then, add them along with chopped banana blossom florets and grated coconut to the batter. 5. Heat the dosa pan. Take a ladle full of batter and spread it in a round shape on the dosa pan. Put 2 to 3 drops of oil on the corners of the adai. When one side of the adai is cooked, flip it over and cook on the other side. Now, Vazhaipoo Adai is ready! Serve. Onion chutney, coconut chutney, and kuzhambu. This entry was posted in Adai and tagged Adai, Banana Blossom, Breakfast Recipe, Vazhaipoo Adai on November 22, 2014 by vikashbhardwaz. A Quick and Tasty Dosa! I make this Coconut Dosa whenever I have excess Coconut Chutney at home. It gives an unique taste to the dosa. Adding curry leaves make it even more tastier. 1. In the dosa batter, add Coconut Chutney and curry leaves. 2. Heat the dosa pan, using a ladle, pour the batter and make a round circle. Apply oil on the corners of the dosa. Heat the dosa until it is cooked on either sides. Now, the Coconut Chutney Dosa is ready! Note. Curry leaves increases the flavor of this dosa. 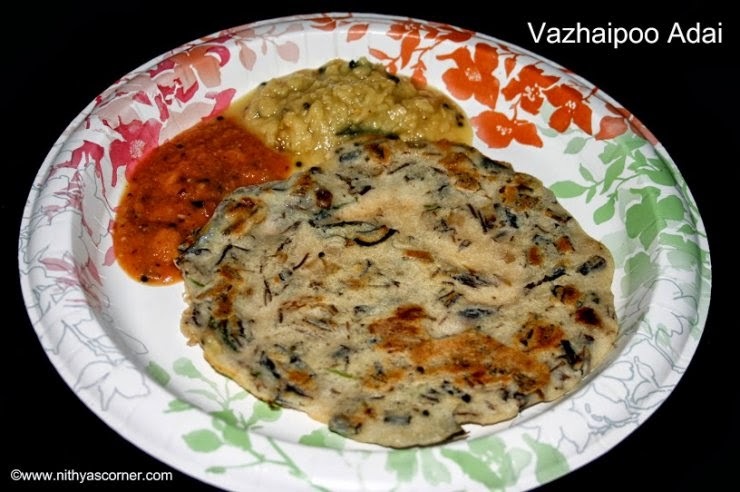 This entry was posted in Dosas and tagged coconut chutney, Curry Leaves on November 22, 2014 by vikashbhardwaz. Whenever I hear the word “Manchurian”, I will start drooling…I just love Manchurian. My favorite is Chicken Manchurian. We have so many Manchurian recipes: Gobi Manchurian, Mushroom Manchurian, Soya Manchurian, Vegetable Manchurian, Cabbage Manchurian, Idly Manchurian etc. I love all of them. However I have tried only few. Idly Manchurian is one among them. Trust me…it is very easy to make. If you have left over idlis, then just give a try. You can serve this dish as a tiffin or appetizer. I make this dish whenever I have leftover idlis at home. Idlis – 4 to 5 nos. 1. Cut the idlis into small cubes. If you are using fresh idlis, refrigerate it for at least 30 minutes. 2. In a mixing bowl, add corn flour, maida, ginger garlic paste, chilli powder, saffron color, and little water. Combine well to form a thick paste. Dip the idli cubes into the batter well. 3. Heat few drops of oil in a dosa pan. Place the battered idlis, and roast the idlis or deep fry them until golden brown. Drain the roasted idlis in a tissue paper. Keep the roasted idlis aside. 4. In a non-stick pan, add a teaspoon of oil and heat it. Add garlic and ginger, and fry for a minute. Then add spring onions (white part), and fry until light brown. Now add capsicum and fry for two minutes. 5. Add soya sauce and stir well for few seconds in high flame. Reduce the flame, add tomato sauce and salt, and stir well. 6. Make a corn flour paste (combine 1/2 teaspoon of corn flour and 2 tablespoon of water). Add corn flour mixture and also little water. Stir well. 7. When the mixture is hot, add the roasted idlis. Then add pepper powder, and stir well in such a way that the idlis are coated well. Sprinkle spring onions (green part) and cook for a minute. Give a quick stir and remove from the flame. Now, Idly Manchurian is ready! Serve hot. Refrigerate idlis for at least 1/2 hour just before cooking as it will prevent idlis from crumbling. Serve hot as it would become soggy as time passes by. Be careful while adding soya sauce as it may change the taste of the dish and also make it salty. Once you add fried idlis, toss it gently or else idlis will break. This entry was posted in Idlis and tagged Chicken Manchurian, Gobi Manchurian, Idly Manchurian, Vegetable Manchurian on November 22, 2014 by vikashbhardwaz.